While I have written in the past about the American fire services’ ability to practice the “art of avoidance” or our reluctance to address problems or deal with situations that we do not feel comfortable with, this crisis needs to be acknowledged and addressed and solutions need to be shouted from the highest mountain. While fire fighter arson is certainly not a new problem, the resurgence of incidents that I see reported in the media has caused me to think that our dirty little secret needs to be moved to the forefront of our recruit training efforts to put an end to it. This is nothing more than a cancer growing within some of our organizations, and it must be cut out. I would also like to take credit for the information that follows, but I can’t. I need to thank the Suffolk County (NY) Police Department, the South Carolina Chapter of the International Association of Arson Investigators (IAAI), and Mr. Tim Huff, who has retired from his position as a Violent Crime Case Analyst at the Federal Bureau of Investigation, for the liberal use of their materials. An incident that occurred last year in June had caused me to step back and look at the problem of fire fighter arson again. A Dearborn, Missouri fire fighter was killed in a vehicle accident responding to a fire that another fire fighter has been charged with setting. My hope is that the information contained in this article will help put a stop to firefighter arson and to keep this fire fighter’s death from being in vain. What I hope to provide is an understanding of the fire fighter arson problem, why some fire fighters commit arson, and the effects that it has on the community and its fire service. I will also touch on the basic profile of a fire fighter arsonist, our responsibilities in preventing the practice, and what actions to take when a problem is suspected. A number of reasons have presented themselves from those who have been arrested for this crime and were willing to share their motivations. The fire fighter arsonist could be someone looking for recognition or who likes to play the role of the hero. It could be their drive to be a reporting party or first on the scene of a fire. Perhaps it is the person who wants to make the most runs, or one who thinks fire setting is the cure to overall boredom within a department without much run volume. It is also practiced by persons with a psychiatric problem that may be compelling a fascination with fire, or perhaps others that have low self-esteem or self-confidence. Some have also noted the social need of wanting to be accepted by others, or wanting to belong to or be identified with a significant group. Praise and being recognized by peers also comes into play. It has also been noted that the motivation is usually not intended to be harmful. The excitement of fire fighting combined with a maturity level that does not realize the harmful effects or the severity of the crime being committed may also be another factor. The effects on a community subjected to fire fighter arson are clear. They include the possibility of injuries or loss of life to the citizens; the property and financial loss due to fire; and the increased insurance premiums that we pay when arson occurs. It can also destroy the community’s trust of its fire department. Look at what can happen to the fire department. Problems here include injuries and loss of life to fire fighters, apparatus accidents, the cost of fire suppression, damaged equipment, and negative publicity and possible liability. What will the effect be on fundraising? The public’s reaction may also cause “knee-jerk” legislation that could seriously impact the fire service. The trust of our communities is something that we need to preserve. What about the person or persons who commit these heinous acts? One would think that the embarrassment to their families and the fact that they will be held accountable for their actions would make fire fighter arson unattractive. The fire fighter arsonist will be arrested, convicted, sentenced and be removed from the fire department. The loss of self-esteem and belonging will be replaced by thoughts of financial losses that include fines, restitution, and loss of employment upon imprisonment. That criminal record will follow these people for the rest of their lives and cause the loss of rights that law abiding citizens enjoy. The South Carolina Chapter of the IAAI’s Fire Fighter Arson Awareness Program provides the following profile of fire fighter arsonists. They are predominantly volunteer fire fighters, although career fire fighters have also been involved in perpetrating this crime. They are mostly white males, 17 to 26 years old, who may be the highly trained and motivated type that always seems to be in the right place at the right time. They could be working in low paying jobs with low recognition and esteem and have joined the department for gratitude. They may also have overactive fascination with the fire service. Some less obvious factors include an unstable home environment as a child, ineffective relationships with parents, and average/poor academic records. They may also have ineffective relationships with their spouse (if married), be going through some unusual personal stress, and using alcohol to release inhibitions when setting fires. 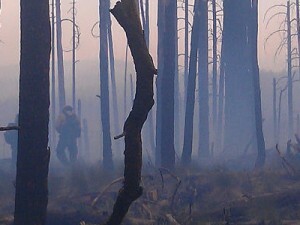 Some additional traits include the fact that fire fighters who commit arson frequently associate with other fire fighters who have a similar desire to be a hero or have a fascination with fire, and that the majority of fire departments that have experienced this problem recently are mostly rural with normally low call volumes. A sudden increase in the number of small fires, false alarms, bomb threats, or similar responses should alert the department to a possible problem. The increase in the severity of fires is also a warning sign. This dirty secret needs to see the light of day and we are the only ones who can illuminate it. Training for recruits and new members needs to include a block of instruction on fire fighter arson that includes the consequences of becoming involved in this activity. The complete investigation of the origin and cause of all fires will also assist in identifying the problem. Prior to allowing someone to join the department, we should be conducting background checks. This should include criminal history, driving record, employment history, references, school records, medical records, credit records, a check with previous fire departments the individual has been associating with and, if possible, psychological screening. While some departments may not be allowed access to all of this information, some effort should be made to check out potential members. Efforts should also be made to monitor the activities of department members. The simple solution to this is to maintain adequate records that include attendance at incidents, training, fire incident reports, and fire investigation reports. Immediately notify the chief of the fire department involved, but if this is not possible because the chief may be a suspect or for other reasons, you may want to confide in another fire service or law enforcement official that you know and trust. Another avenue would be a call to your local “Crime Stoppers” Program. If you suspect a fire fighter of fire setting, but do not have specific proof, the chief or other officer may be able to confront the suspect with suspicions. You may also want to observe if there are any changes in the trends that aroused your suspicions. If you do not feel comfortable confronting the individual, or if there is hard evidence of arson, notify your local law enforcement agency immediately. Fire fighter arson is a cancer that can be cured. Taking action against this problem is the only practical way to reveal illegal conduct or major abuses of public authority and represents the highest form of loyalty to the fire service and its mission. Remember that in this venue, practicing the “art of avoidance” only gives victory to criminal action and improper conduct. Thomas Aurnhammer is Chief of the Farmington (NM) Fire Department. A 26-year fire service veteran, he is a member of the adjunct faculty at the New Mexico Fire Fighters Training Academy and the National Fire Academy. Tom holds an associate degree in fire protection and is a graduate of the National Fire Academy’s Executive Fire Officer Program. He is also a licensed emergency medical technician, a certified fire investigator, and serves on the board of the National Fire Academy Alumni Association.